I haven't heard much from the Occupy Whatever crowd lately. Rumor has it they're re-grouping their energy (now that winter is over) and planning on occupying whatever shortly, with protests planned all over the country. Some time last year someone sent me this. I never got around to posting it, which is a shame since I think it says it all. My Father said that the occupy people should "get jobs and vote." I think that pretty much sums it up. Not quite. You forgot to mention "bathe". I am a PROUD supporter of Occupy and a dedicated, informed voter. Your bigotry is the only thing here that stinks. So let's chill with the stereotypes, 'k? Whatever misguided notion you have of Occupy it's just that-- misguided. Hopefully not willfully so. Just curious, Julia. WHY do you support the Occupy folks? From everything I’ve seen and heard, they demand entitlements and free rides that are not at all in keeping with the Constitution. You’re clearly a responsible and mature adult – so what about their protests do you support? I believe much of the legitimate complaints the OWS crowd has can be traced back to unconstitutional government interference in the free market. I have seen several of those signs and I think they are GREAT. We did not pay for our children to go to college, if they wanted to go, they had to work for it! Of course, they aren't "occupying" anything but jobs, so I guess it was the right decision. This occupy what-ever is a hoax but that's what politics and news is these days. All parents cannot be as good as you. Mine pushed me into college, and pushed me into taking out the loans. Yes I was 18 but no, I was not capable of grasping the responsibility involved. 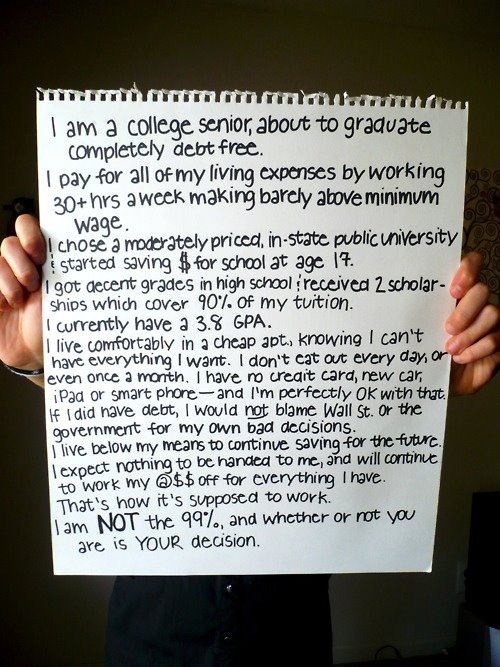 I don't side with OWS either, but I do understand their plight. If you can't get a VERY good job out of college, with 40k plus in non dischargeable student loan debt you will be a serf for the rest of your life working crap jobs. The reason I don't side with OWS is that we as individuals need to rely on ourselves for employment and not expect "corporations" to "give" us jobs so we can buy new cars and IPhones. The answer to dealing with a corrupt system is leaving it. I, myself, plan on becoming a new age "farmer", or at least grow enough to sustain my family when the descent comes.